Have you ever found yourself in a power blackout saying, “Oh that’s okay, I’ll just watch TV.” Then you realize there’s nothing you can do but sit in the dark. We are very dependent upon our electronic gear to get us through the day. It’s what keeps our phones charged, our microwaves cooking and our televisions tuned in. As beneficial as all those electronics make our lives, there will come a time when they’ll need to be replaced. These are not the type of things that you can simply throw out the garbage. Take care of your old television and other e-waste the right way by turning it over to Junk King Jacksonville. E-waste is defined as any device that is powered by electricity. That certainly covers a lot of territory. How many old televisions do you have in your house? What about DVD players, desktop computers, laptops, printers and relic VCR players? None of those things should ever be thrown out in the trash. They all need to be dismantled at a certified e-waste recycling center. Only then, can those components be carefully broken down and disposed of in a responsible manner. If left to decompose in a landfill, some of those devices could unleash toxic compounds. Many states have Artie made the move to ban e-waste be put in landfills. So what is the option? Often you might see an e-waste drop-off day being promoted by an organization. This means you need to load up your car with all your electronics and drive to the drop-off site. That isn’t always the most convenient way to dispose of these things. Instead, you can turn them all over to Junk King Jacksonville. Since they began collecting junk over 10 years ago,Junk King is in the dedicated to avoid making trips to landfills. They were going green long before it was popular. Junk King Jacksonville has set up working partnerships with many recycling facilities throughout the area. They know exactly where to take your old TV and other electronic gear. 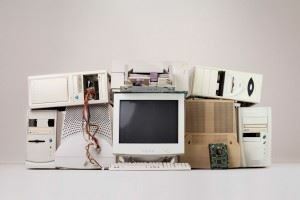 As long as they are loading up all the old electronics, you can also put them to work clearing out the rest of the rubbish from around your house. In no time at all you’ll be living in a junk free home. The best way to handle old TV disposal and junk hauling is to give that job to Junk King Jacksonville. This entry was posted in Jacksonville e-waste disposal and tagged e-waste, junk King Jacksonville, old TV, rubbish on July 25, 2017 by Junk King. Last updated July 25, 2017 .